There is nothing like Saturday morning. There’s relief and excitement in Friday night, but also an intensity sharpened by weariness. Sunday morning usually has an element of luxury for me – it’s these mornings that I’m most likely to laze in bed – but the impending week gradually forces its way into my consciousness as the day wears on. Saturday morning, is squarely between the two: well wound-down, but still assured of the time and possibilities that stretch ahead. It’s undemanding, yet energising. I think that Nice ‘n’ Urlich captured this mood best in the opening track of their 1999 album Everything I Do, in which a velvet voice intones (over a background of orchestral warblings): “It’s Saturday morning, you’re listening to bfm and the very funky sounds of Nice ‘n’ Urlich”. The music then merges into the relaxed yet groovy beat of the cheesily-named second track, Love Capsule Deluxe, and just like that, in the space of 25-seconds, you are transported into the very essence of this divine time. It has become essential for us to get up early as possible on Saturday mornings, and we’re usually on a bus heading to the West End by 7.30am at the latest. 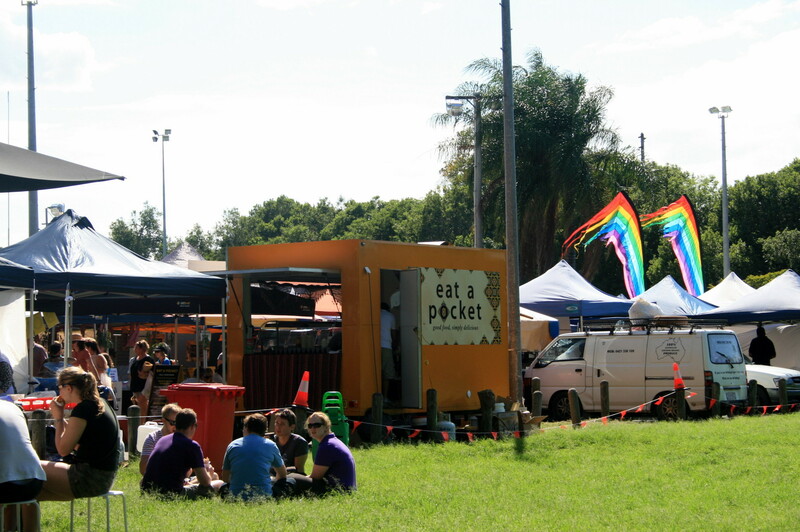 The West End markets are incredibly popular, and it helps to get there early before the crowds gather. We have breakfast, meet up with fellow-market-goer friends, chill out and listen to the band, buy fruit and vegetables, and sample the various delicacies on offer. Most days we’re home in time for me to go to a 10.15 yoga class at the gym, but if not, I relish a trawl through the local Vinnie’s second-hand clothing shop, or make a sneaky stop at Black Pearl Epicure to purchase yet more treats to fuel my weekend grazing. The following photos capture a few of these moments experienced over the past few months. Have a great weekend everyone. At the West End markets, well before the crowds descend around 9am. 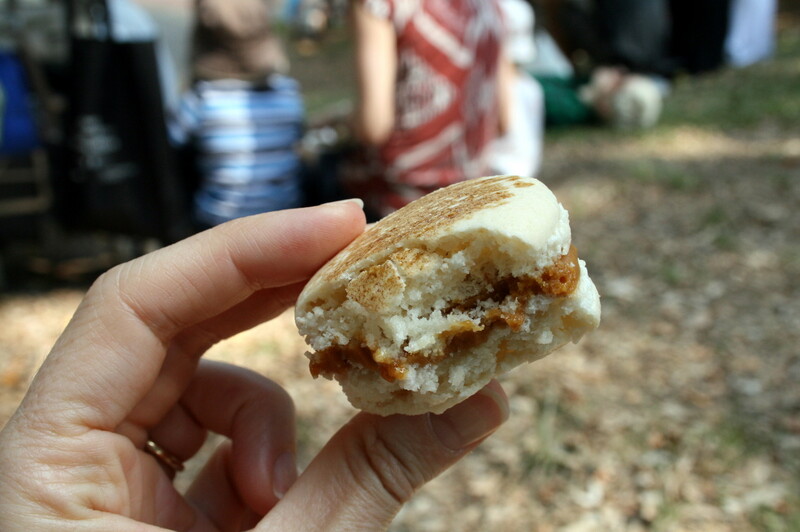 Halfway through a salted caramel macaron from the French bakery stand at the market. 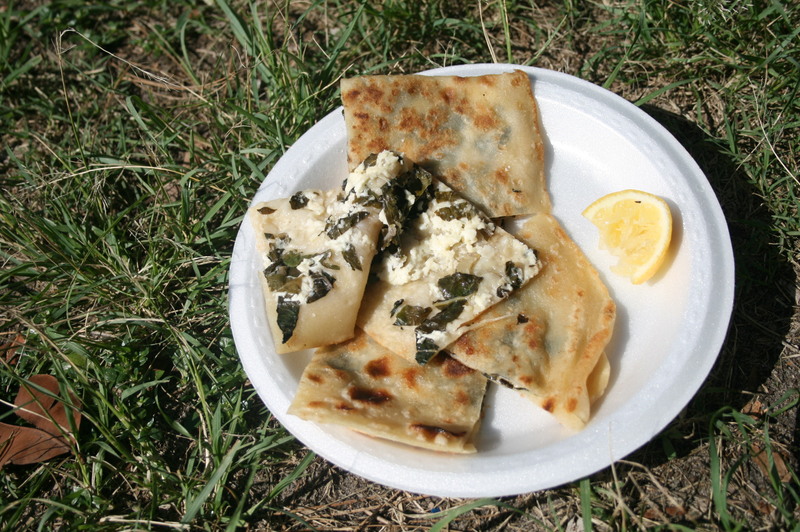 Spinach and feta gozleme from the Turkish food stand, eaten on the grass in the early morning sun. This bread is delicious – crunchy at the edges, still chewy in the centre, and freshened with acidic lemon. 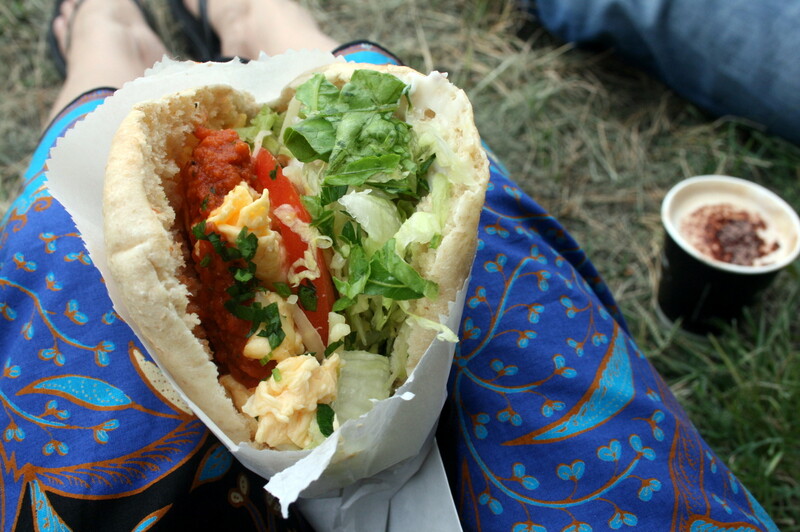 My current favourite market breakfast: wholemeal pita filled with scrambled eggs, lettuce, tomato, hummus, and topped with a sweet-spicy tomato salsa. 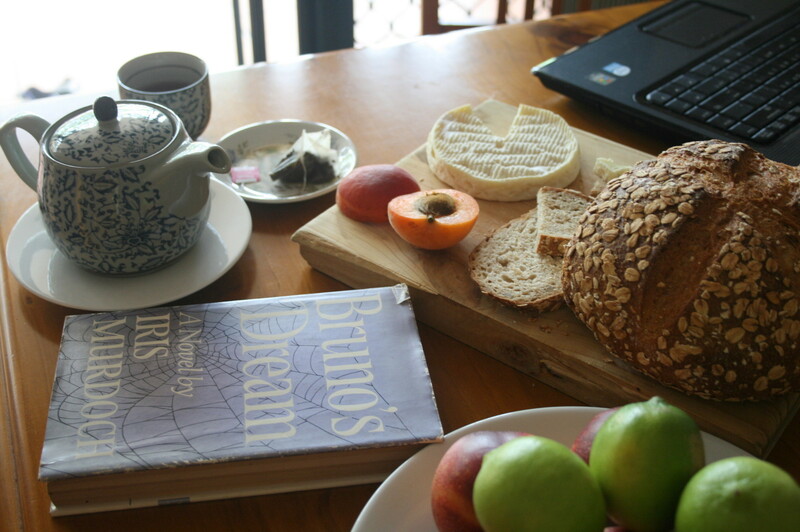 With a cappuccino on the side, this is Saturday morning heaven. 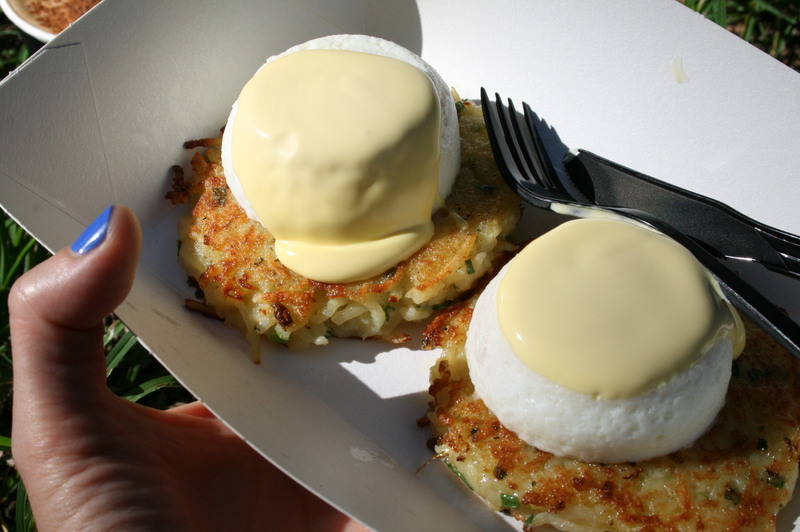 Another sampling from the German roesti stand – potato roesti topped with poached eggs and hollandaise. I am a firm believer in one utterly decadent breakfast every week. 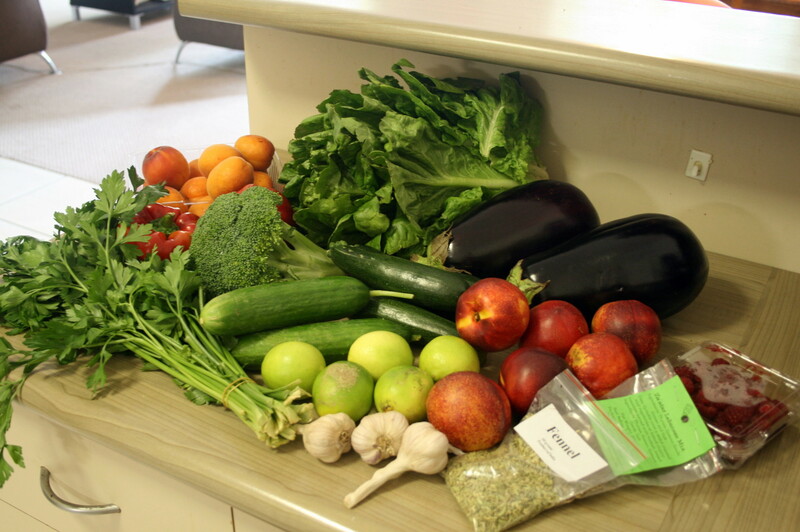 A typical market haul: a range of fresh vegetables, a bunch of robust Italian parsley, the sweetest apricots ever, small, tight heads of organic Australian garlic, and a spices (on this day, fennel seeds, and a za’tar spice mix). Shopping for fruit and vegetables at the supermarket is starting to feel totally uninspiring. Home from the market. On this particular day I tucked into a sheep’s cheese that melted and oozed over the beer and sunflower bread bought from our favourite bread-man. I admired the retro cover of this Iris Murdoch novel I purchased for $1.50 at Vinnie’s on the way home. I also (as if I needed more) drank rose and vanilla tea while catching up on my favourite blogs, becoming inspired (as usual) by other people’s creativity and humour and the same-but-different rhythms of their lives. What a way to start the weekend. Where would the human race be without experimentation? Just one bite and I think even you would be sold Kerry! Now I must run and proliferate further decadence – fresh figs are waiting to be roasted with honey and cinnamon, eaten with yoghurt and sighs of contentment…discipline is severely overrated.